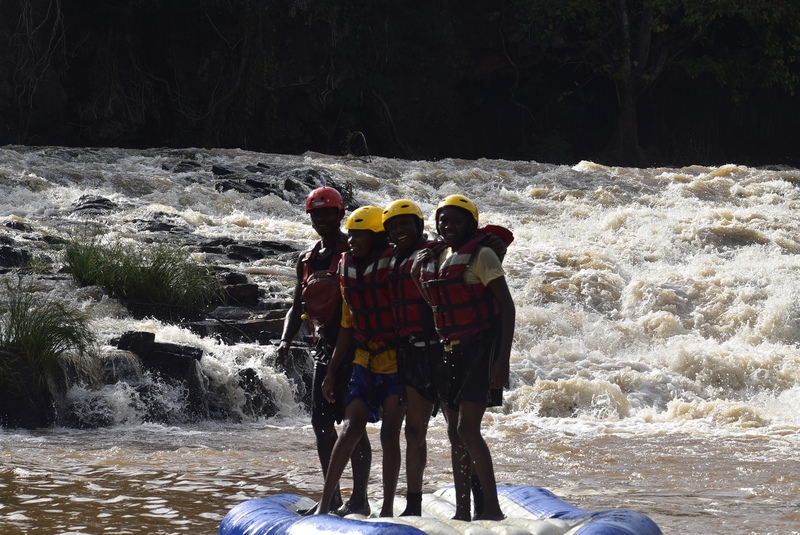 White water rafting at Rapids camp, Sagana.🚣 – Tembea With Lulu. The lawn of the campsie. Beautiful scenery on our way to Rapids camp. Its a campsite so the tent structures are ready. My dad and I. Behind us is the Sagana Waterfall. On the 22nd of June, a Thursday, my dad, my cousin and I took a road trip to Sagana, Kenya with the main aim of white water rafting. The experience was exhilarating. The scenery was breathtaking. Everything about the place is amazing; the people, the fresh air, the refreshing mist from the waterfall…. You can literally feel the mist from the waterfall from where I’m standing. It’s amazing. We left Nairobi at around 12 noon. We used Google Maps to get there because my dad wasn’t sure about the directions. It was really fun. We listened to X FM, a rock music station and when we couldn’t get the frequency as we went further away from Nairobi, we listened to really old music and sang along to Coldplay. The journey took about two hours, so we got to the camp at 2 pm. At first the place seemed deserted and very unattractive. We even thought that we were lost. but as we drove further into the camp, we were relieved. The lawns were lush and green and we could hear the waterfall from the admin block. We met our tour guide and he took us to the river, showed us the rapids and the waterfall and gave us a quick preview of what we’d be doing then he showed us where to change into rafting-appropriate clothes. When we were done dressing, we were given life jackets and helmets and our guides carried the raft to the river. This was our canoe guy in case anyone of us fell too far from the raft. So we go to the river and before we started the guide taught us the basics; how to hold the paddles, paddling types, what to do when you fall off the raft, how to sit on the raft, etc etc. Then he said we should first ‘taste’/’test’ the water (Well its because he said; “kwanza nataka tuanze na kuonja maji”- swahili, which in direct translation is ‘taste’ the waters but I’m almost sure he meant ‘test’ the waters so…😂) We had to get in and swim a little, rather, float and move around because of the life jackets, to get rid of the fear we might have had. the water was excruciatingly cold at first but it felt really good as we stayed longer. I’m the one in the pale yellow t-shirt holding on to the canoe. After a short while we got onto the raft and practiced the paddling techniques. There’s something very interesting that our guide did. It’s a trick he calls The Capsize. He turned over the raft and we all fell into the water. we were all extremely shocked and confused. When we were done practicing, we started the actual Rafting journey. We did all the other tricks that he had taught us as we went down the stream towards the waterfall. The most interesting part was the waterfall. We tried as hard as we could to paddle towards the waterfall. We got so close we almost went underneath it, but the water was too much and too strong that it kept pushing us away. Normally, the raft is able to get to the other side of the waterfall but the guide said that at that time the water coming down was too strong. But all in all just the feel of it was something. The roar of the waterfall in my ears, the mist and water falling on my face, the rush of adrenaline as we paddled towards the waterfall, the excitement and each burst of fresh air in my lungs. It was all so beautiful, one of the best feelings in the world in my opinion. After the waterfall we continued down the stream through rapids and calm water. We got off the raft a couple of times and swam in the water a little where the water was calm. After a while we got to a place with whirling water. Here, we got off the raft and the guide showed us another trick. It’s called the swirl. We would slide off a rock and into the water where the water was whirling and let the water spin us and then swim to a rock onto which a rope was tied to. He specifically told us not to fight the water. That was also something else. The fear of drowning, the burst of energy while trying to swim away from the whirlpool.It was just amazing. We did the swirl trick a couple of times before continuing down the stream. twice I thought I was going to drown, but the whirlpool pushes you up and away from it so all of us were safe. Once again, no injuries at all were incurred. On our way down, we went trough a level 5 cataract where the raft falls and splashes into a mild rapid. We paddled on for little while and then we came to the end of our rafting journey, sadly, but every good thing must come to an end. we carried our paddles back to the camp site as we reminisced the good things that had just so shortly passed. We got to the camping site, changed back into the clothes we came in and as we were about to leave, we met our hosts who were the owners of the place and they invited us for a cup of coffee. They were very good company and they told us a lot about the place. They have really big plans for the place. Rapids camp, Sagana is a place to watch out for. It is a legitimate tourist attraction with beautiful scenery, fun activities to indulge in and it has accommodation, which are tents with all provided facilities. It is a good spot to host parties, to get away on vacation, or even for a one-day visit. They told us about the main Rafting tour that takes almost up to 3 hours long, which sadly we did not have the time to experience. They also told us about the waterfall plunge which for some reason I am not aware of, we also did not do. In the long term they are planning to have zip-lining and hotel rooms. It was finally decided that we have to, rather, must revisit Rapids camp, Sagana for the full Rafting experience and to also experience other water sports. I honestly cannot wait. Email me your questions if you have any. That’s it on Our Road trip to Sagana. Please be sure to like, follow and share. Thanks a lot for your support. This was an interesting read, I always say the mark of a good travel blog is in how descriptive it is. I’ve always wanted to go rafting here but have never had the opportunity to so your explanation (and all the photos) about the experience is much appreciated. N.B: When travel writing always provide a link to the place or at the minimum a contact number. You want your readers to ‘take action’ after reading the article. Otherwise a job well done and keep writing! Thank you so much. I actually feel motivated to write more now. And I’ll be sure to add links and contact information to m,y future posts. Bless you.